Never one to be content with 'the way things have always been done,' Doug Armitage of General Concrete Finishers in Moose Jaw, Saskatchewan keeps pushing the envelope with concrete. For over 30 years, he has been pouring and resurfacing driveways, patios, and interior floors for both residential and commercial clients. "I was doing exposed aggregate in the 80s, borders and stamps in the 90s, and now overlays and stains," he says. "I'm always keeping up with what's out there." 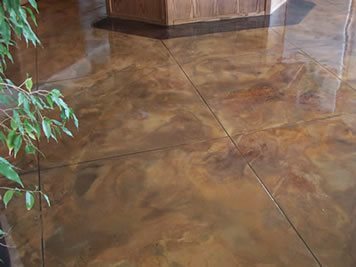 His drive to keep up with the latest has led him to continuously experiment with concrete products and techniques, and has enabled him to develop one-of-a-kind finishes on concrete. "We can achieve certain looks because we've been able to experiment and develop the systems," Armitage explains. One of the most recent applications that Armitage has branched into is polymer modified overlays. "We've started doing high-end work with cementitious overlays," he explains. "It's currently about 5-10% of our business." And it's one of the applications that Armitage likes best. He recently developed a proprietary system for installing polymer modified overlays that creates a distinct look not achievable with other products. "We install overlays," he explains, "so that the stains 'take' a certain way." Getting concrete to look like natural marble is one of those unique looks. "We can make concrete look like marble," he describes. This is what attracted one particular client to revamp the entire main floor of their house. "We did approximately 1,200 square feet of floor space," he says, which included the living room, hallway, and bedrooms. The result was a stunning resemblance to marble and natural stone with mottled colors that added depth and warmth to the home. "You won't get that look just with staining," he says. 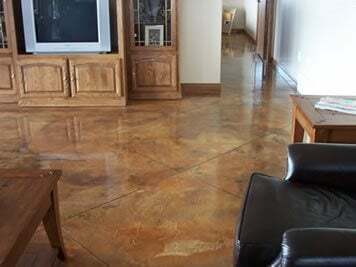 "I've tried to create the same marble-like effect with regular staining. I've even used bed sheets and cheesecloths to try to get the same look. I've only been able to achieve the real natural, marble look with the polymer modified overlay." And to top it all off, that particular overlay was installed over a wood subfloor. Using a 3/8" overlay, Armitage and his crew covered the home's original wood flooring. 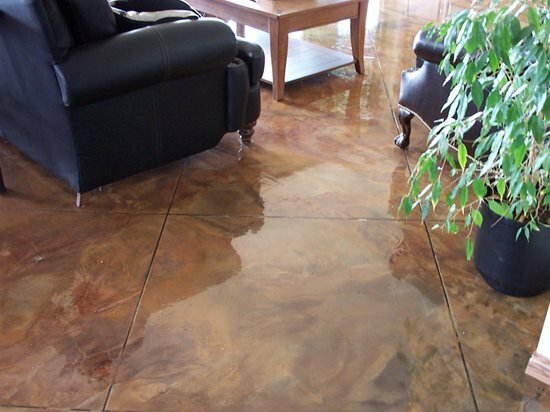 "We have a system for prepping the floor that includes putting down a scratchcoat and overlay and then staining," he explains. "Many contractors worry about delamination over wood," says Armitage. His system prevents this. He says, "Hairline cracks are inevitable. I've been able to use them to my advantage by sometimes using stain to fill the cracks to give a more unique look. Armitage also points out that "hairline cracks are evident in natural stone. They're the same look we're trying to create manually. It's what makes it look so natural." Armitage plans to continue on with testing concrete products and perfecting his techniques. It's what has set him apart in Canada and attracted more and more business from homeowners requesting his marbled floors. "In this project," Armitage recalls, referring to the marbled overlay (see photo above), "the homeowner saw a picture of a previous project of ours with this look. They came to me with the picture and wanted me to create it," he says. An upcoming project includes a home built in the 1900s. "We're redoing the basement floor," says Armitage. "We'll pour a cast-in-place floor, install radiant floor heating with a 2" top, then overlay." As with all his other projects, the look is sure to be remarkable.